today i'm trying to pick myself up, pull myself together, and kick my muse into gear. i got started before noon, which is a big deal these days, and spent about an hour on it. some frustration and then frustration at the frustration, but i kept it together, trying to remember that i'm always in a learning process. i knew i wanted to get back into faces today, but didn't care about where it went, didn't care about realism (as you can see), just tried to get some shadows and highlights where they needed to be. i put this one on a card from my daddy to one of the kids, and let my daddy speak to me. i put arrow washi tape down, and was thinking "which way to happy". then i put down the prettier pink tape and the bright background green and yellow. 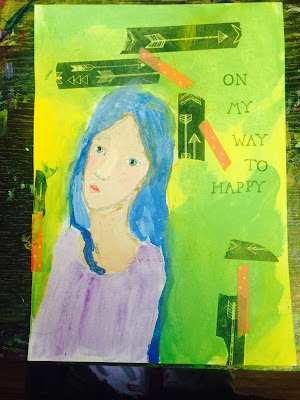 the words "on my way to happy" came to me, and i like that. a lot. where ever i am, i'm on my way to happy, i'm doing my best with what i have, i'm climbing out. it's ok, i'm doing it now. and, yes, i'm happy with this card!